- Description: Track has designed the new 300C to be our first entry in the lower mid performance arena, and our first symmetrical core in three years. We feel this will give the true Track fans the opportunity to be able to be competitive on all lane conditions, including the driest. In addition, we will also garner consideration of bowlers new to the sport to make a Track ball their first ball. The 300C is constructed with the Track symmetric core which is a proven core shap in the industry for several years. We then wrapped it with a brand new coverstock blend, the LMP GEN1 with performance pearl. This cover is designed to be very clean through the front part of the lane, with the predictability of the ever popular “C” balls. 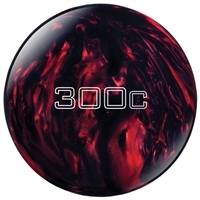 If you liked the 505C, this ball will be your go-to ball when the 505C is too strong. Each new ball from Track will include a microfiber cleaning pouch with instructions on its use. We feel this is a great addition in order to help our customers maintain their performance products. The 300C was designed for the entry level player or a dry lane. The ball is perfect when the 505C is too much at the break point. The 300c is at home when the lanes are breaking down and the heads are going. It is smooth through the fronts and continous on the backend. My 300C is drilled 5 x 5 with a small hole on the VAL and the pin is located below my fingers. The ball is very smooth and controlable at the break point but still finishes like a truck. The 300c allows me to be able to play the friction alot straighter than other balls. It is an arrow weaker than the 505C and 715C. The real difference is at the break point because it is symmetical it is not real aggressive and smooth. A good addition to my arsenal of Nuggets!!! This Ball is Awesome. This is my new 300C that I drilled up this past Wenesday and I am thrilled to be a Track Guy. I drilled this ball for some length. I wanted the ball to get down especially when I'm in a tournament when there breaking down and I need something to get thru the heads with. Well this ball does that and more. I have had a 701, 711, and 698 in all 3 leagues since Wenesday. High Game of 278 and Low of 202. I didnt know what to expect and now Im thrilled on a predictable ball I can count on. I can't wait till I can get my hands on a 916AT when I do I will give a review on it. If you don't throw Track guys your missing out on a fantastic line of balls. Likes: I like that its smooth and controllable. Its not jerky off the spot. Likes:Picked this up used from my local pro shop looking for something for fried lanes. I switched to this ball in the third game of league play when my Midnight Vibe was too much. After two frames to get lined up, I threw the last six for a 228. This ball is very smooth and predictable. I think I may buy a new one, and keep it for when this one is dies. Dislikes: I tried this during practice the next week, and on fresh oil, it just skated. But this isn't the condition I purchased the ball for.I was just taking a shot to see what would happen. Likes: Ball goes long then heads to the pocket where it destroys the rack. Bought this ball to use on our 4 game summer 3 man league. But just had to use it on a fresh shot to see how it works shot 680. This was a senior league. Not just me alone on a fresh pair. Ball allows me to play down and in which is my wheelhouse on THS. Carry was very strong. a great ball from Track. With the factory finish it stores energy and hits hard. And the Rico layout gave me a consistent ball reaction. Why the Rico layout? Because all I read about this layout is it does not roll out. And that has to up pin carry right ? If the layout is great on difficult shot like the US open then it has to kill a THS. I have several balls drilled Rico and my average just keeps going up.